The Zembula platform allows you to easily set up a custom form that will populate your emails directly into a specified list in your ESP. The following instructions will guide you through the setup process. Once logged into the Zembula platform, navigate to the Company section at the bottom left of your dashboard. You will be taken to a dashboard for Integrations. You will see a number of different direct integrations which you can use if you see your ESP listed there. In this guide, we will be showing you how to set up a custom integration if your ESP is not listed. Click Add on the Custom link. You’ll be taken to a dashboard where all custom forms you have created will live. Click Add Account at the right of the dashboard. Upon adding an account, you will see the two sections shown above. Click on the pencil icon to name your integration. From here, you will have the option to have the Zembula team set up the form for you or do it on your own. The easiest way to set up your form is to have us do it for you. 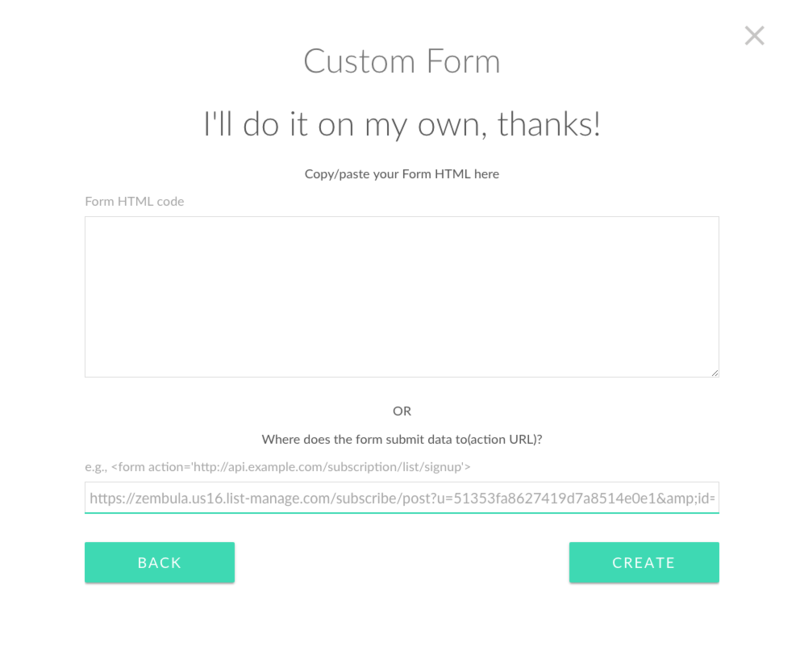 Simply input the URL where your form is located and submit it by clicking Request Help. We will set up the form within 24 hours. If you prefer to do it yourself, click the link that says I’ll do it on my own, thanks! Now that you have the appropriate action URL specified, it’s time to set up the form! You’ll be taken to a screen where you can specify the fields you would like to use in your form. 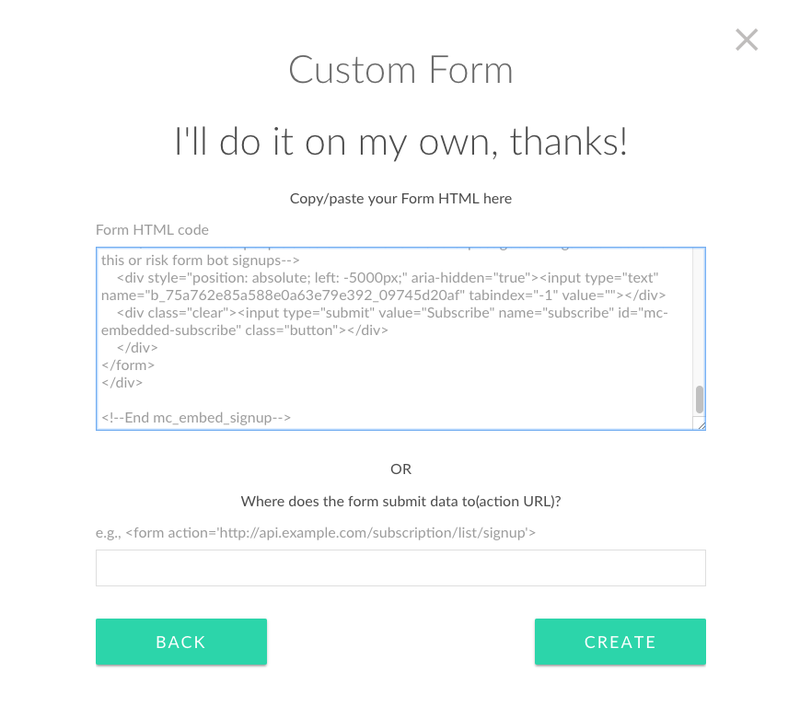 By default your form will be named Custom Form #1. We recommend changing that to something that pertains to the list that you will be submitting to. In the image above, you can see that the Email field is already added. However, you will need to change the Field Name to correspond with the merge tag from your ESP. For example, Mailchimp uses FNAME for first name, LNAME for last name, and EMAIL for email. Your Field Label will be what people see when they fill out the form, so you can name that whatever you want. To add a field, simply click Add Field. Fill out the Field Name as explained above as well as the label. Then, select what type of field it will be from the dropdown list. The Field Name will be the code after the word Name. Once you have all of your fields set up and properly mapped, you are ready to use the form in your experiences! NOTE: ESP's often behave differently, so, in certain circumstances it may be necessary for the success window to open in a new tab, rather than in the same window as the experience. Click here to learn how to set up your experience to collect email addresses.